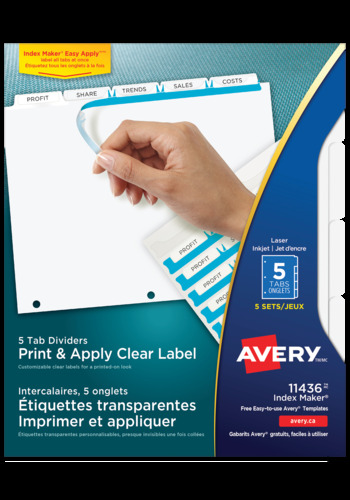 Print & Apply Clear Label Dividers let you organize your binder quickly and easily with professional results. The Index Maker® Easy Apply™ label strip lets you label all your tabs at once, and the clear labels virtually disappear when applied for a printed-on look. Durable divider tabs resist tearing. Use free templates to personalize and print your tab labels in minutes. Print & Apply Clear Label Dividers let you organize your binder quickly and easily with professional results. The Index Maker® Easy Apply™ label strip lets you label all your tabs at once. Use free templates to personalize and print your tab labels in minutes. Peel a strip from the label sheet, align the strip on the dividers then stick the labels to the divider tabs. The clear labels virtually disappear when applied for a printed-on look and the durable divider tabs resist tearing. Turn your written work and presentations into professional, printshop-quality documents in just a matter of minutes—right at your desk. Create custom dividers and use the Avery Design & Print Online software to easily personalize your tabs in minutes. Easily apply multiple labels in seconds with Easy Apply Strips. Design: Choose a blank or pre-designed template and the number of sets you need. Easily add images, and content on each tab. Print: Preview your template, run a test print, then print your customized labels.